Highly shareable: You can share webinars with your customers via email or by embedding them directly into other pieces of content. For example, you can write a blog post that links to a webinar and convinces readers to watch it. 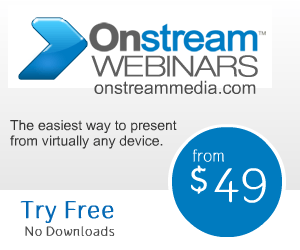 In doing so, you will gain extra mileage out of a single webinar. Highly engaging: While other digital assets may work to inform readers about your products and services, webinars give readers the opportunity to engage directly with your brand. Webinars are ideal for answering customers’ questions in real time and gaining useful feedback about your company’s offerings. Full of value: It’s amazing how much information you can fit into an hour-long webinar, such as useful statistics, interesting videos, use cases and interviews. Customers attend webinars to receive valuable information that they can turn around and use to enhance their own businesses. And when you provide it to them, you build your credibility as a trusted source of information. Easily scalable: One of the best things about hosting webinars is that they can scale to meet the needs of your customer base. As your organization grows and more customers start tuning in, you can expand your webinar platform to accommodate a larger number of interested attendees without having to invest in additional capital expenditures. Click here to learn more about how Onstream Media can help improve your integrated marketing strategy.